The Otolith Group, founded by Anjalika Sagar and Kodwo Eshun in 2002, uses essay films to explore forms of critical futurity and the psychic simultaneity of historical experience. In their new film, In the Year of the Quiet Sun, postage stamps produced in Ghana between 1957 and 1966 are assembled into a political calendar of pan Africanist images. At “After Year Zero”, Eshun discussed the film, philatelic time travel, pan African pop art, moments of resistance and excavating the past. The film is screening in London until November 8 at Delfina Foundation. 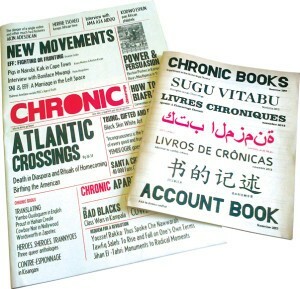 A written version of Kodwo Eshun’s discourse features in the December 2013 edition of the Chronic (available here). This Chronic also offers forays into interlaced subjects of power, resistance, protest, mobilisation, mobility and belonging. In its pages writers, photographers and artists from across the pan African world challenge political processes, question identity and interrogate economic justice.